When I, over two decades ago, decided to look beyond Catholicism, I had a look at all major religions. Shinto was one of those. Recently I was reading a little book which had a text of a Dutch Shinto master. He had a few things that made me think of ‘heathen concepts’, a couple of remarkable correspondences. To look a little further I dove into my library. I indeed own a little book about Shinto which had a slightly different approach, but did confirm some of the concepts that caught my eye. 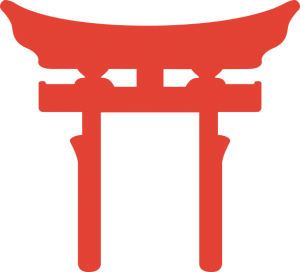 Time to have a bit of a closer look at Shinto ‘from a heathen perspective’. “Shinto” (or “kami-no-michi”) is a bit of a generic term. Nowadays there are many forms of Shinto. When you are going to look up information you may notice that some people will say that Shinto is a religion, others will say it is not. I have the idea that people who see Shinto as a religion, look at it through ‘Western eyeglasses’. They will speak about “Gods” and “holy texts”, while neither really seems to be the case. Perhaps it is better to see Shinto as a ‘worldview’ or even a ‘way of life’. There are texts of importance to Shinto, by the way, but they are more like chronicles than Divinely inspired texts to have to be followed. Shinto does not have a ‘start date’ or an ‘inventor’. It is regarded the original religion of Japan, that of the indigenous people (the Jômon). Ironically, the term “Shinto” is actually Chinese. It consists of two symbols and means something along the lines of ‘way of the kami’. The term was only invented in the 15th century, probably to tell it apart of other religions that had entered Japan. The lesser used Japanese term is “kami-no-michi”. Confucianism suposedly entered Japan in the 5th century from China, as did Taoism later on. Also Buddhism found its way to Japan in the 6th century and in different forms. An argument to not see Shinto as a religion is the fact that many Japanese appear to have a combination of Shinto with another religion as their personal path. Some people say you are born a Shinto and 80% of the Japanese are Shinto, while, for example, 34% are Buddhists, so there must be overlap. As a matter of fact, there are words to refer to Shinto-Buddhistic synthesis, such as Shinbutsushūgō. However Shinto does not appear to have always been so ‘limited’, nowadays you can see Shinto has a religion of the present and, for example, Buddhism of the hereafter. It is not uncommon that when a child is born, it gets a Shinto ceremony for its adoption into the family ((s)he becomes a Ujiko), people will have Shinto ceremonies when they marry, but the person may have a Buddhist burial and be burried on a Buddhist cemetery (there are Shinto cemeteries). The deceased will be changed in the ‘Shinto logs’ from Ujika into Anujigami. It is also interesting to see that Japanese have no problems with ‘contradictory’ beliefs from the combination of Shinto with something else. Shinto has proven to be very adaptive and this is why there are quite a few different ‘versions’ and combinations with other religions. This reminds a bit of heathens who incorporated the “white Christ” into their pantheon at the dawn of Christianity. Speaking of Christianity, in Japan you can find Buddhism (many forms), Confucianism, Taoism and Christianity, all which exist in mix-forms with Shinto. If there are also mixes with Judaism, Islam and Jainism I do not know. The best-known elements of Shinto are the Torii, the ‘doors’ of which you can see an example on the right. Early on, a Shinto shrine would have been built in a different style than a Buddhist Stupa. As time passed by, Shinto architecture started to incorporate elements of Chinese architecture (and other styles) and the temples started to look alike. Even the Torii changed from very simple portals to the more eleborate Chinese-style structures that we know today. Still, the Torii are the element to tell a Shinto sanctity from another one is that someway on your way to a Jinjo, there is a Torii to pass under before you can (can) enter the temple. Another temple does not have such a Torii. I have mentioned the Kami. This is a fairly general term that some people like to translate to “Gods”, but it can just as wel mean “spirit” or “spiritual essence”. Even a deceased ancestor can be(come) a Kami. Depending on what approach book you read, you will learn that Kami are worshipped or that they are not to be worshipped. Many people have an akamidana, a house shrine, where they bring food offerings such as is done on large jinja (shrines). These household Kami are usually the ancestors. The question is whether this is worship. However the word Kami can be both singular and plural, there is a longer term to refer to the collectivity of Kami: Yaoyorozu no Kami. This literally means ‘eight million Kami‘. This is of course not a definate number, it shows there there is an indefinitely large number of Kami. There are Kami for every person if needs be. I mentioned the ancestors. Either or not as Kami, ancestors make part of the extended family or Uji, just as ancestors are part of the ‘sib’ or ‘clan’ of a heathen. Uji is an interesting concept. It does not just mean ‘extended family’, but it is the ‘social construct of the moment’. When at home, somebody’s Uji is his/her family, but the Uji can just as well be the company where somebody works, the team (s)he sports in, etc. It is the Shinto worldview that makes the Japanese to value collectivity higher than the individual. Japanese are teamplayers. Thus we come to another interesting concept, that of Wa. Wa is something like ‘beneficial harmony’. It is very much like Heilagr. Like Heilagr, Wa is partly dependent on ‘social construct’. There is family Heilagr and family Wa, or Heilagr or Wa of a for the whole nation. Where ancient Western religions put stress on honour, the Japanese reason the other way around, they try to prevent Kegare or impurity. Impurity would have a negative effect on Wa like dishonour does on Heilagr. This purity goes pretty far in Japan. It is the reason people take off their shoes when they enter a building (houses and of course a temple in particular) and why they perform Temizu (‘ritual washing’) before entering a Jinja. It also works on other levels and so you see the entire train company making excuses when the famous Shinkansen train has been too late. Every employee of the company needs to wash away the Kegare to prevent ‘damage’ to Wa. Shinto is a very nature-based worldview. Harmony (Wa) also needs to be kept between men and nature. Before the construction of a building can take place, there will be a ceremony to inform the local Kami that their realm is going to change and they are asked for their prosperity (compare the discussions in Iceland when a road would displease landwights). If something has been changed, balance has to be restored. There is much realisation that men is part of something bigger, including elements unseen. Similarly, there are also many ceremonies as ‘rites of passage’, such as the earlier mentioned namegiving and wedding ceremonies. Such ceremonies are held just as well at the beginning of a year, at the start of a project, even at the start of a company. All such passages are marked ceremoniously. Following nature, there are four seasonal ceremonies, Setsubun at spring, Nagoshi Harae at the summer, Niiname sai at autumn and Hatsumode at winter. A noteworthy element makes the Shimenawa. These are markers of ritual space, a line with lightning-like white paper flags (Shide). They can mark a (temporary) ritual space, but can also be found on gravestone or ‘generally sacred spaces’ (or objects). I do not want to write yet another article about Shinto, but I do want to draw attention to a couple of very striking similarities between the Shinto and the heathen worldview. Especially the concepts of Uji and Wa, how ancestors have their places in these concepts (you would not want to harm the Wa of your ancestors for example). There is probably a lot more to look into, but I have not (yet?) made a very in-depth study of Shinto. I do like the idea that ancient Shinto concepts and practises are also applied to our own day and age, such as the ceremonies when starting a company or the placing of the mini Jinja at a skyscraper. In heathen practice I often see that people project themselves back into the time they find an interest in, but do not often incorporate that worldview into our own time and age. Perhaps there is something we can learn from Shinto practice. When you look at the ‘tree of religions’, I doubt that Shinto would be on an Indo-European branch, but again this shows that ‘indigenous religions’ have concepts incommon that we have lost lateron. Well well, another paganism vs Shinto article.